CDL A Drivers! Earn $1,200/Week Guaranteed! Hiring Class A CDL Truck Drivers! Great Pay and Home Weekly! Class A Drivers! We Have Dedicated Routes for your Hometime Needs! DEDICATED RUN FOR CDL-A TRUCKER WITH GREAT PAY! EARN $1100 WEEKLY, GET HOME DAILY AND NO TOUCH FREIGHT! CDL A Truck Drivers! Home Weekends & Great Pay!! At the forefront of it all, the Hogan brothers remain dedicated to an over-riding commitment to customer satisfaction – a commitment that has been the foundation of their family’s success for nearly 100 years. To be recognized as the most respected transportation provider in the industry by continually focusing on providing the safest and highest quality experience possible for our customers, employees, and strategic partners. 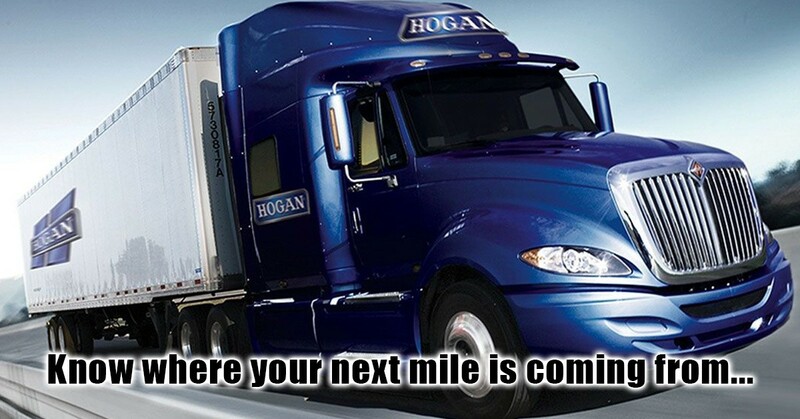 Hogan’s mission is to provide excellent value for our customers by providing high quality, innovative, solutions-based services resulting in a long-lasting, mutually beneficial business relationship. We create a highly respected brand through dedication to quality, safety and service excellence throughout our organization. We provide our employees with a work environment that enables them to thrive professionally and personally. We drive the company’s financial success and long-term sustainability. Our employees are passionately motivated to execute the Hogan vision and positively contribute to the communities in which we live and work.